Models of Teaching 9 Edition Models of Teaching: The Heart of the Core gives readers well-developed approaches to teaching, grounded in research and experience and designed to ensure the high levels of learning they are intended to generate. With the goal of providing the strongest positive effect on student achievement while keeping in line with the current emphasis on standards-based education, Models of Teaching pairs rationale and research with real-world examples and applications to provide a strong foundation for future and new educators. 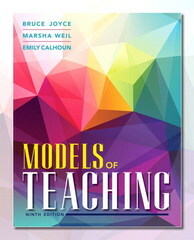 The book encompasses all of the major psychological and philosophical approaches to teaching and schooling, includes thoroughly documented research on the various models of teaching and their subsequent positive effects on student success, and gives teachers the tools they need to build strong classrooms that accelerate student learning.